Just a couple weekends ago we were lucky enough to attended the Seasons of Love Bridal Show at the Grand Seawell Ballroom at the DCPA. It was a spectacular event produced by Out Front Magazine that showcased many unique and elaborate wedding vendors. The magazine just celebrated their 39th anniversary! Each vignette was inspired by a different season and team of vendors and Blue was lucky enough to get the spring season! While all four seasons were displayed elaborately in the middle of the theater, each vendor from all the teams had their own booth set up around the room for information. The set up was above and beyond expectations! 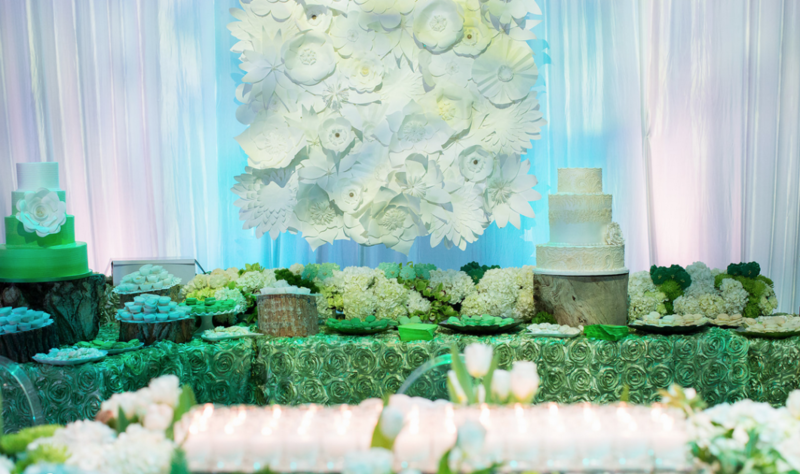 The talented vendors Blue was teamed up with are as follows: Walli Richardson – Planner; Azucar Bakery; Alan Perry Floral and Event Design; Devon K. Photography. The pairing of these wonderful companies made spring a fun and fabulous season! Blue even had a live model that wore the “Marnie” dress from WTOO, which complimented the spring colors of white and green to bring the vignette to life! To say the event was remarkable would be an understatement!